In her documentary !WOMEN ART REVOLUTION, director Lynn Hershman Leeson sets out to tell the story of the feminist art movement of the sixties and to show how, to quote the film's website, it, “radically transformed the art and culture of our times.” She begins with the thesis that art in the sixties was dominated by minimalism, a movement that sought to remove all meaning and personal expression from art. The feminist art movement is then presented as coming into conflict with that status quo because of its emphasis on having a message. The problem is, minimalism was hardly the only dominant art trend of the sixties. Pop art was at least as important if not moreso, and I can't imagine discussing art in the sixties and seventies without mentioning the movement. And yet that's just what this film does, even though some of the feminist art we see would have probably been a good fit with pop art (this is especially true of an eighties offshoot of the movement called the Guerilla Girls, who I would have liked to see more of because they at least appear to have a sense of humor). Leeson, herself a part of the movement she is documenting, focuses more on politics than on the art and its impact. This makes much of her film seem every bit as academic and boring as some aging sixties radical giving a lecture on Marxism. Don't get me wrong; some of the sociopolitical commentary is necessary. Leeson's complaint that female artists have long been under-represented and treated poorly by the art world is a valid one, and that state of affairs is absolutely crucial to the birth of feminist art. Also when the film discusses some of the feminist issues that influenced artists in the movement, that matters as well. There's just too much focus on that aspect, and at times one gets the feeling that ideology is more important than to Leeson than the work itself. 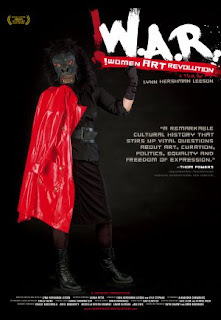 My biggest complaint about !WOMEN ART REVOLUTION is that we see too little of the actual art produced by the movement. What we do see includes some arresting works, but the images zip by with no context or discussion of what influenced them, what they were trying to convey, or what later works they in turn influenced. There's also some hippie-dippy performance art involving naked women wearing stuffed genitalia, and no film on a modern art movement would be complete without at least one work (in this case, Judy Chicago's “Dinner Party”) that served as an excuse for grandstanding congressmen to rail against the NEA for funding “pornographic” art. As an introduction to the feminist art movement for a general audience unfamiliar with it, I don't think !WOMEN ART REVOLUTION works very well. No doubt there are those who will find the information contained here of great value, and I'm glad that Leeson had the foresight to record interviews with so many of the artists involved in this particular movement, many of whom are no longer alive. Personally I was intrigued enough to want to learn more, so I suppose Leeson has at least succeeded on that front. 2 1/2 out of 4 stars.